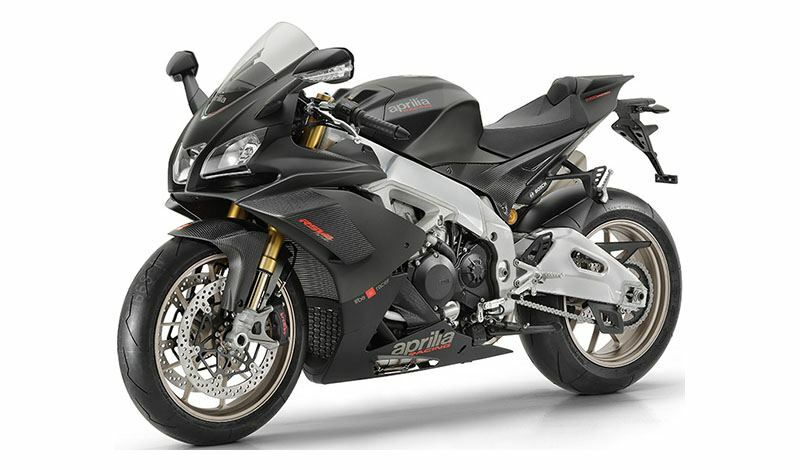 Aprilia RSV4 1100 Factory boasts exceptional performance combined with a racing frame and suspension and an electronic controls package, both evolved even further. 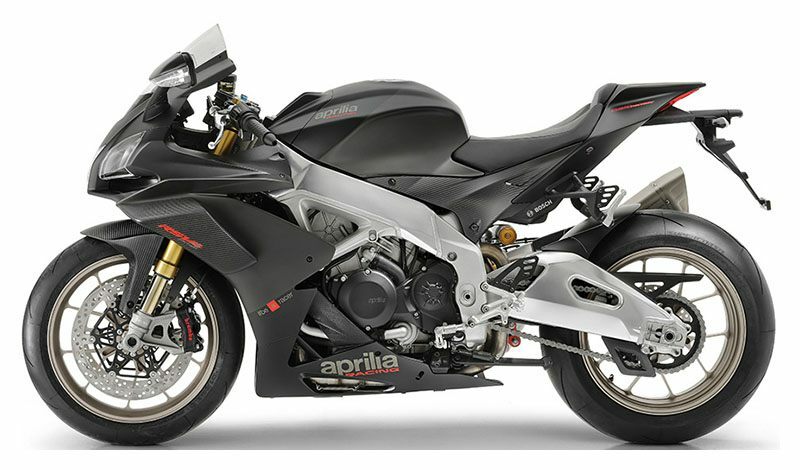 In line with the exclusivity of this model, the Aprilia Style Center has worked hard to make the RSV4 1100 Factory unique and recognizable even by its colors and attention to detail. 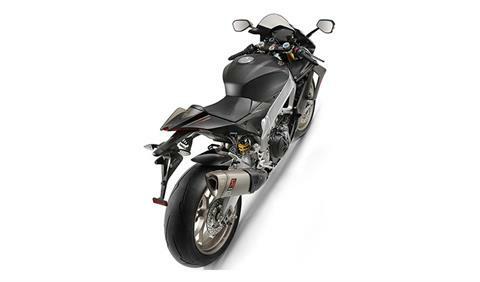 The color combinations aim to enhance the exclusive nature of prestigious materials such as carbon, in contrast with the titanium finish of the street-legal Akrapovic exhaust terminal, the same color as the forged aluminum wheels. 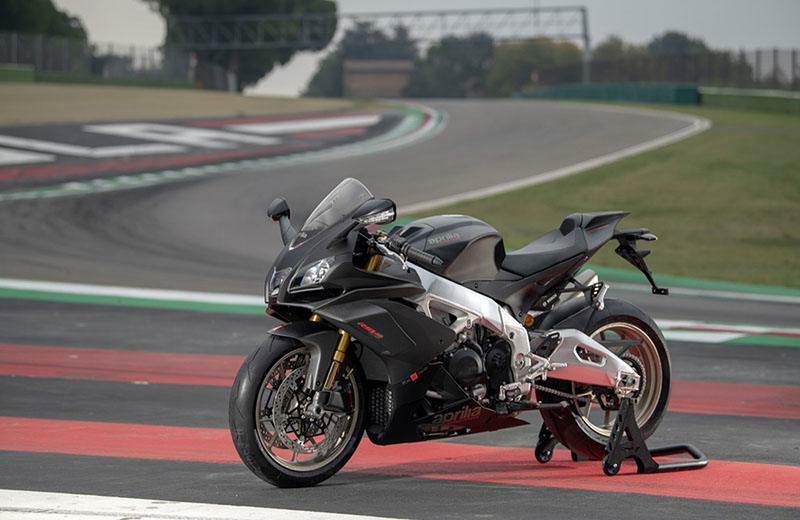 THE SUPERBIKE ENGINE: RSV4 1100 Factory engine displacement is achieved thanks to new pistons with bore that went from 78 to 81 mm; the 52.3 mm stroke remains unchanged with respect to the 1000 V4 engine that still powers the RSV4 RR. The compression ratio of 13.6:1 also remains unchanged. To improve wet sump lubrication, there is a new oil pump with greater flow capacity; the piston temperature has now been lowered thanks to the use of a double oil jet. The timing system boasts optimised intake valve timing, while the primary drive now counts on a longer ratio for fifth and sixth gear. The electronic injection system now uses a throttle valve support with a more aerodynamic profile in order to improve fluid-dynamic permeability. The Magneti Marelli 7SM ECU has a new specific map with limiter management set at 13,600 rpm. This brings maximum power to 217 HP at 13,200 rpm, setting the bar in the category; maximum torque also benefits from these changes, obtaining a clear increase along the entire range of more than 10% compared to the 1000 cc engine and reaching a maximum value of 122 Nm at 11,000 rpm. 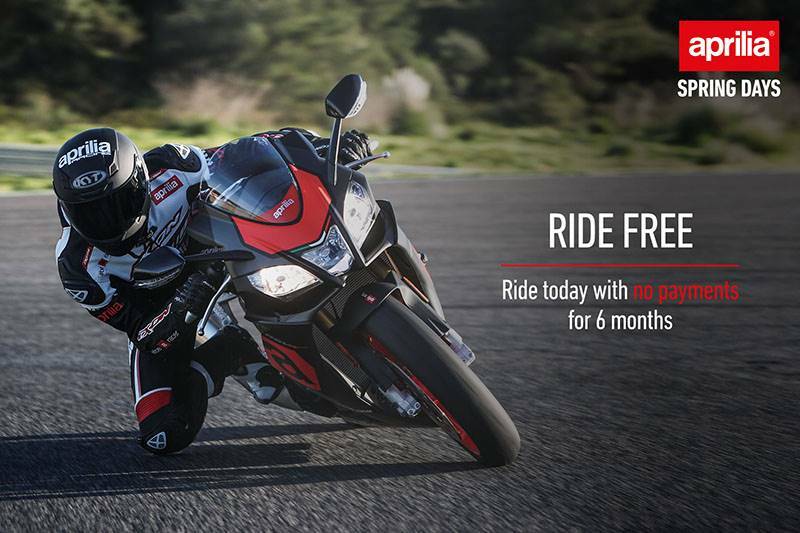 This is a very important value that makes the RSV4 1100 Factory not only more effective in acceleration even from low speeds on the track, but also more thrilling to ride on the road. Last, but not least, the exhaust system was optimised, not only in the layout of the manifolds, but also adding the street-legal titanium Akrapovic terminal as standard equipment, significantly lighter than the previous unit. The new Aprilia RSV4 1100 Factory also benefits from finer calibration suited for the revamped performance of its APRC electronic controls package. 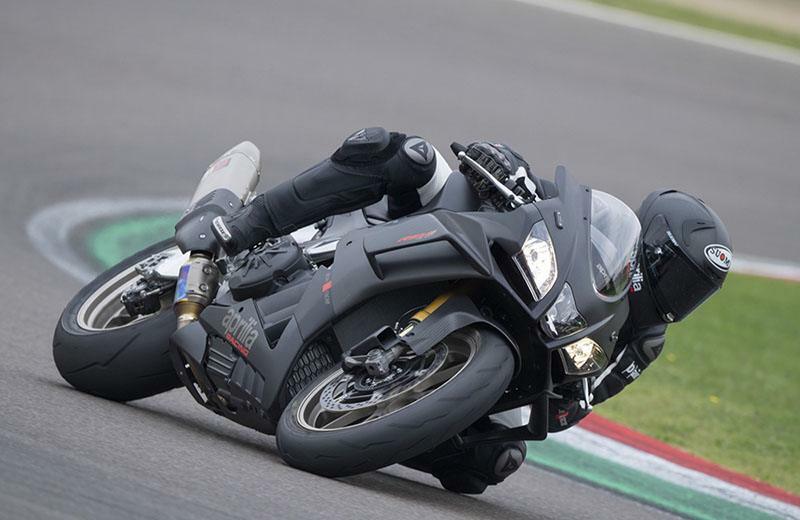 APRC: FROM APRILIA, THE CUTTING EDGE IN ELECTRICS: Aprilia RSV4 1000 RR and RSV4 1100 Factory are fitted with an exceptional dynamic controls package designed and patented by Aprilia. Each one of the two models benefits from a specific calibration of all the controls in line with the different performance levels the two bikes can boast. 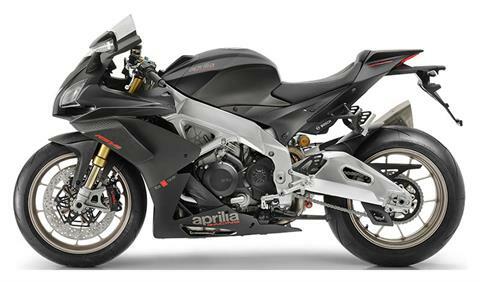 APRC (Aprilia Performance Ride Control) is the well known dynamic control suite derived directly from the winning technology in world Superbike, one of the most complete and refined currently available on the market.The particular positioning and orientation of the inertial platform that governs the operation of the system allows for optimum possibilities of detecting the bike's dynamic conditions and, consequently, more effective electronic control strategies. 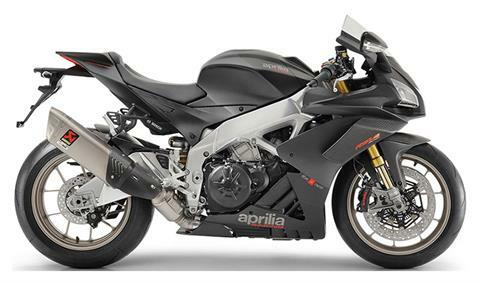 The fourth evolution of Aprilia's APRC is perfectly integrated with the electronic fine tuning guaranteed by the full Ride-by-Wire throttle control which is completely built-in and requires no other components for electronic throttle valve management. This provides clear benefits in terms of weight (compared to a traditional system, the savings can be quantified at 590 grams). Rear -220 mm diameter disc; Brembo caliper with two 32 mm separate pistons. Sintered pads. Pump with integrated tank and metal braided hose. Bosch 9.1 MP ABS with cornering function, adjustable to 3maps equipped with RLM (Rear wheel Lift-up Mitigation). APRC System (Aprilia Performance Ride Control), which includes Traction Control (ATC), Wheelie Control (AWC), Launch Control (ALC), cruise control (ACC) and speedlimiter (APT), all of which can be configured and deactivated independently.